Temperament: Friendly but like his to be on his own sometimes. Hello my name is Salvo. Sadly my current owners are not too well and cannot look after me anymore so I need to find a new home. I am a friendly boy, I like it when people visit, I like a fuss and really don't want them to leave! I sometimes like to be left alone though and go and sleep quietly in my bed. I like my walks and find it better to walk on a harness. I don't like other dogs coming up to me or getting to close when I am on my harness - it is a bit annoying - but if they leave me alone I don't mind them going past. I really like my toys - a bit too much really as I sometimes get carried away and wont hand them over! But I like a ball and Kong and get left them when I am on my own. I don't mind if you take any food off me though - although I would prefer to eat it all of course! I like travelling in the car and I can be left in the house. I wont chew anything and I am very clean. I think I would like to be the only dog in my new family and I don't want to share with a cat either. I don't live with children now but if they were older and let me have a bit of 'me time' when I want we would be okay. So what do you think would you like to be my new family? If so please contact Senior Staffy Club and hopefully I will see you soon. 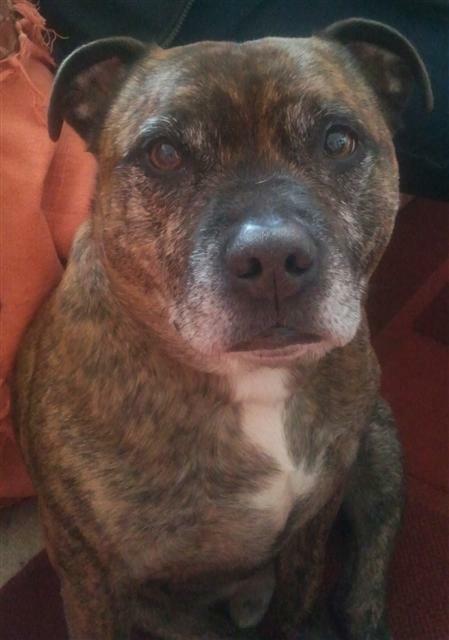 Salvo is on our matchmaker scheme so any prospective adopter would need to visit him in Staffs.